Classic things are always in fashion. This is something that does not change with time; it is appropriate in any situation and never lets down. As for eye makeup, it also has its own classics, which have not lost their popularity and have remained relevant for decades. What is the classic eye makeup technique? It consists of a few simple steps that everyone can easily remember and perform. ★ First, apply a light base color on the upper eyelid up to your eyebrows. ★ Second, add a medium shade in the middle of your eyelid on top of the base color. ★ Third, apply dark (contrast) eye shadows closer to the outer corner of the eye. In general, three shades of eye shadows is not the limit. The more colors and shades you use, the more interesting the results are. But it is the time-tested classics that work. Of course, you also need to do your eyelashes and eyebrows, and you can even add wings to your eyes if you wish. Remember that unnaturally thin eyebrows are no longer in fashion and can add a dozen years to your age. Only slightly adjusted eyebrows of moderate natural width are in fashion. 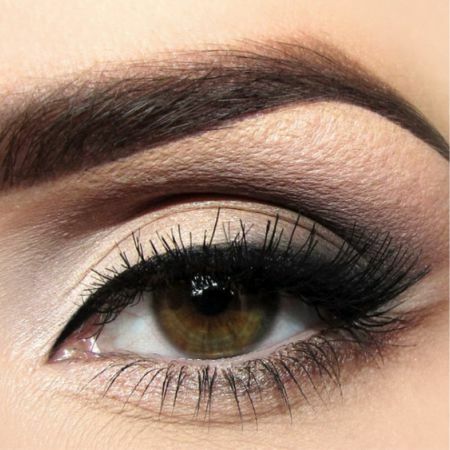 The color of your eyebrows should be in harmony with the color of the hair, it may even be a little lighter. Black eyebrows are only suitable for brunettes. Generally, it is better to avoid black color in eye makeup unless you are a young sixteen- or eighteen-year-old girl. It is better to choose a brown eyebrow pencil and a colored eye pencil that is either blue, purple, green, etc. A little bit of white eyeshadow in the inner corner of the eyes will make your eyes shine, and that tired look will disappear. Although a valuable sound sleep is no doubt the best remedy. Good sleep is very useful for the preservation of beauty and health. You should never go to bed with makeup on your face! Do not forget to remove makeup, no matter how tired you are or how much you don't want to. Remove your makeup with the help of special products, don't use soap and water. Be aware that water-resistant mascara, eye shadows, and eyeliner are difficult to clean with the usual soap. Be sure to take care of the delicate skin around the eyes. Clean and nourish the area regularly, and your look will be magnificent. Classical eye makeup technique fits everybody, makes the face more expressive, soulful, and beautiful. Plus, the application of this makeup does not take too much time. Like the article «Classical Eye Makeup Technique»? Share it with friends!